← Enchantée! Pleased to meet you! 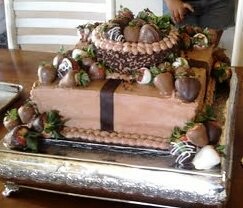 Chocolate and Strawberries and Cheesecake. . .Oh My! This is an engagement cake we did this weekend. It’s a marble cake with chocolate mousse filling and chocolate buttercream frosting. The top layer is yummy New York style cheesecake. The chocolate dipped strawberries were preferred by the bride-to-be over flowers. Hard to argue with that!